Nestled in the base of Camelback Mountain, part of the Pocono Mountains, the sprawling Camelbeach Waterpark features a slew of attractions, including the Triple Venom speed slides, the twin bowl rides, Vortex and Spin Cycle, and the mat racing slide, Checkered Flag Challenge. For those who prefer tamer thrills, the park offers the Blue Nile Adventure River, an 100-foot-long lazy river, and the Kahuna Lagoon Wave Pool. And for the kids, there's Camel Cove and Pharaoh's Phortress, two interactive play area with waterfalls, kiddie slides, kid-activated sprayers, and tipping buckets. 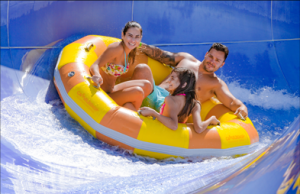 Other Specials & Coupons To view Camelbeach Waterpark Admission Tickets, other Specials and Coupons, go to their special page by clicking here. Camelbeach Waterpark updates this page throughout the year, so check back to see if new specials and coupons have come in. Note to our visitors Camelbeach Waterpark coupons and specials can change without notice. So please visit their official website to make sure of the latest pricing and coupons.